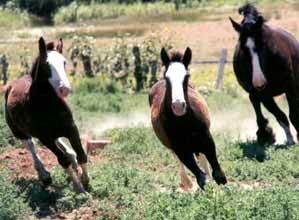 Shire mare Lil' Liza owned by Brenda and Dave Daniher of La Junta, Colorado, had twin fillies on May 6, 1998. 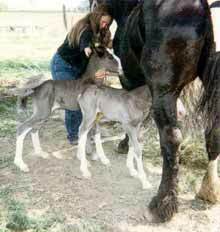 They are registered with the The American Shire Horse Association as Daniher Dixie Jazz and Daniher Daisy Dawn. The photo to the right shows them at one day old. In the photo below they are several months old, enjoying a run with Lil' Liza. At birth the fillies were half the weight of their half-brother Frankie, born one year previous, and about 4 hands shorter. By two they were just one hand shy of his size at the same age. Brenda and Dave Daniher would enjoy hearing from anyone else having live Shire twins.